[GOV] One world. One Contact. For more than 15 years, Broadcast Solutions has been a specialist in the planning and production of mobile production equipment and satellite solutions for the broadcast industry. The experience we have gained in building more than 300 OB Vans and Satcom solutions gives us a decisive advantage in integrating innovative communication and data security technologies into mobile units for security forces. 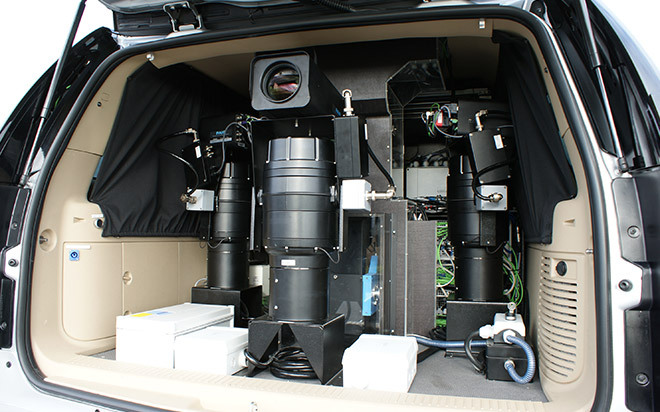 The results are innovative, mobile surveillance units that include the latest HD and UHD transmission technologies with advanced wireless and satellite communications. The surveillance vehicles, emergency vehicles, special vehicles, mobile command and control centres developed by our team combine the most innovative technologies with sophisticated space and vehicle concepts for a multitude of possible deployment scenarios. Our mobile units significantly improve the user’s performance, and demonstrate the possibilities in the surveillance and security sectors. We achieve this through the combination of high-resolution video technology, wireless communication via mesh networks or satellite, with our technologies for data backup, the latest video and lens technology as well as ultra-flat antennas that enable transmissions via Satcom on the Move (SOTM). Recording and transmission of data in any form, the communication with other units and the data transfer can take place completely autonomously in our vehicles. We ensure the transfer of the recorded data and the communication with other units with future-facing technologies. Broadcast Solutions integrates traditional Satcom solutions with parabolic antennas, VSAT, Satcom on the Move or IP-based mobile Ad Hoc Networks (MANet) and self-healing mesh networks that enable bidirectional communication.